We offer an extensive range of drinkers suitable for internal and external use. The plastic used in our drinkers has high freeze/thaw cracking resistance, a particularly important feature in freezing conditions. The 4L Micro Drink Bowl is designed with JFC’s unique double wall for extra strength and durability. 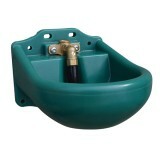 The Micro Drink Bowl is fitted with a float valve, Polycarbonate Valve Cover and a drain off plug (50mm). The 2L Nose-Fill Drink Bowl is designed with JFC’s unique double wall for extra strength and durability. The nose fill valve dispenses water on demand ensuring fresh water is always available. Water supply piping suitable for pipe fixing. 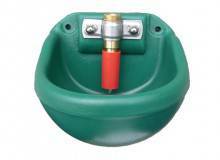 This product is a heated polyethylene drink bowl suitable for cattle and horses. The drink bowl and valve work in temperatures as low as -30°C.